One winner from each age category will be chosen. Artwork must be on a solid white sheet of unlined paper and no larger than 8 ½ x 11 and no smaller than 5 ½ x 8 ½. Paint, marker, pencil, and crayon are all acceptable. Dimensional art is acceptable as long as it can be photocopied. Artwork must be submitted with the entry form and within the size parameters. 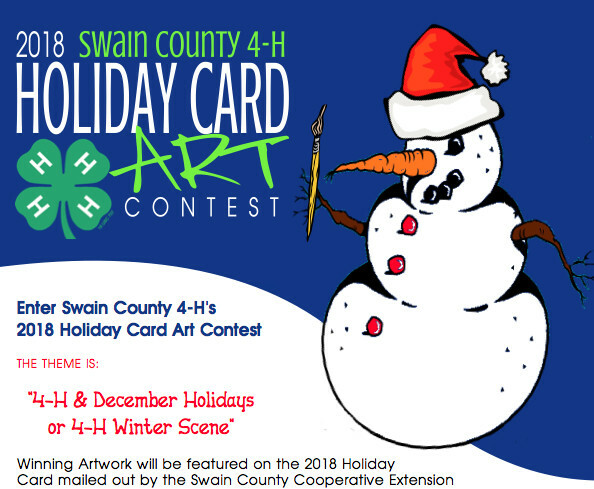 Artwork must show December Holidays or a winter scene AND include an aspect of 4-H.
All artwork must be original work by the artist. By submitting artwork for the contest, you and your legal guardian agree that your name age, club, and school may be used on the Holiday Card and mailed out to the public. All artwork submitted becomes the property of the N.C. Cooperative Extension of Swain County. We reserve the right to modify the winning artwork to fit on the Holiday Card. DEADLINE: November 16, 2018: Artwork must be received by October 26, 2018, at 5 p.m. Entries must be mailed to the County Extension office or dropped off during regular business hours at 60 Almond School Road, Bryson City. Contact Jennifer Hill, 4-H Agent at: 488-3848 or jrhill9@ncsu.edu.